A Pecha Kucha presentation is when 20 slides are shown for 20 seconds each (6 minutes and 40 seconds in total). We are looking for presenters for our November event. Any and all are welcome to present on topics related to language teaching and learning. This creative event promises to be a rewarding experience for all involved where people can have fun sharing ideas and thoughts about their classroom experiences and research. 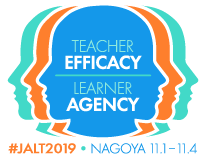 The well-known researcher and authority on motivation in language learning, Zoltán Dörnyei, will be presenting at Kitakyushu JALT in June 2018. More information. While there's no meeting scheduled for December, join us for our year-end social on December 9th. Read on for details. Details of our officer line-up for 2018 are available here: http://jalt.org/chapters/kq/content/chapter-officers-2018. There are a few changes this year, with president Zack Robertson stepping down after serving for a number of years. We thank him for his time and dedication to the Kitakyushu chapter. Please note that we will be moving to a new venue near Nishikokura for the remainder of this year's meetings. Details are on the location page. We will also be moving the starting time of the meetings back a little, so meetings will now run from 7:00 pm - 9;00 pm.